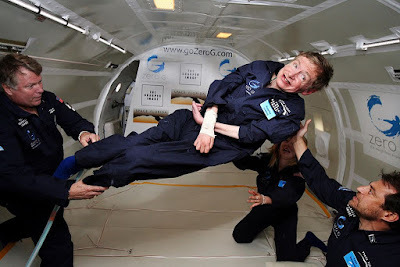 Image credit: "Physicist Stephen Hawking in Zero Gravity", NASA; Jim Campbell/Aero-News Network. I finished my evening run and returned to a phone full of notifications about the passing of Stephen Hawking. I was never lucky enough to attend one of his lectures but I, like so many, know his work well, have watched many videos, and have many of his books. He's an inspiration on so many levels. He's beat physical challenges, faced intellectual challenges to his theories, and - like Einstein and other great minds - has boldly crossed over into non-science topics, including art, politics, and religion. He helped us understand the universe and, in many ways, ourselves. If there are aliens watching us, they undoubtedly understand the huge loss that our planet is now experiencing...whether we humans realize the enormity of the loss or not.